For family entertainment it is hard to beat Cape Cod mini golf. It seems to bring out the competitive spirit in of all of us, usually with everyone trying to beat Dad. I can keep my hands steady when the kids are trying to beat me, but I become a little unnerved when I realize that my wife has victory in her sights. Yes…We are a competitive family when it comes to mini golf. If you were to ask my kids any day of the week…What do you guys want to do today? The answer would be a resounding…Let’s play mini golf! Needless to say, we play a lot of mini golf, and when we do, we are looking for a course that is well laid out, requires some skill as well as luck, and most importantly, is well maintained. If you own a miniature golf course, please read that last part again…and most importantly, is well maintained! Our favorite Cape Cod mini golf courses are impeccably maintained, challenging, and an absolute delight to play, complete with caves, waterfalls, bridges and more. Located at 14 Canal Road in Orleans, Cape Escape is the Lower Cape’s largest adventure golf course. Family owned and operated, these guys are obsessed with keeping Cape Escape impeccably clean and well maintained, and it shows. What sets this mini golf course apart from the rest is that after your round, the kids can hand feed the Koi fish in the pond. If you are looking for the best mini golf that the Cape has to offer, try Cape Escape today. Located on Route 28 in South Yarmouth, Pirates Cove is a very close runner up for the title of best mini golf on the Cape. It features 36 holes of swashbuckling fun. Well maintained and usually very crowded, even with 2 courses to choose from. Mark – Centerville, MA – Pirates Cove, S. Yarmouth. Employees were excellent. They were friendly and fast workers. Suzanne – Pittsfield, MA – Pirates Cove, hands down! Played both Cape Escape and Pirates Cove – Pirates Cove was by far more interesting and challenging. 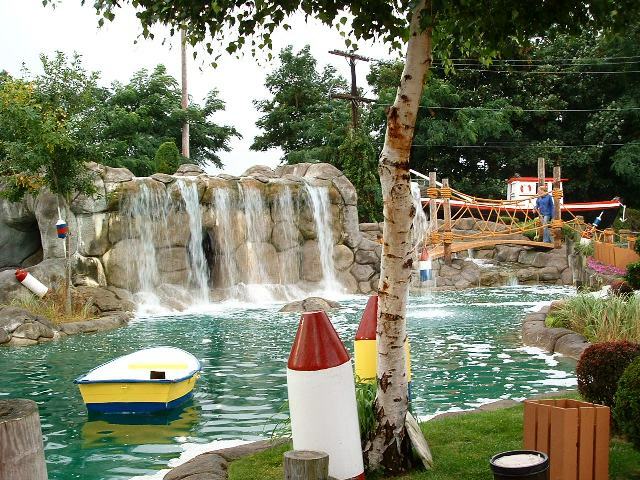 Please vote for your favorite Cape Cod Mini Golf by leaving a comment below!